I worked up 1000 yards of singles the other day. I wanted to use them as singles so I had to treat them a little differently. When spinning for a plied yarn we add a little more twist to the singles. If we were to take them off and use them without plying, they would be defined as “energized singles”. There is nothing wrong with using these so long as you understand how to use them. Energized singles bias. If you are using them for lace you really don’t need to worry much unless they are super crazy biased then they just won’t be any fun to work with anyway. If you want to make socks or something like that from biased singles, just be aware of what you have and make use of the bias. Knit through the back loop to straighten it out for parts like the heel and make a rounded toe. A hat you don’t need to worry about making it straight at all. There is a place in the world for energized singles if you know how to use them. I’ll talk more another time on using them but today’s singles are not energized. My singles are thin and low twist, when hung up, they don’t twist back on themselves. Set your wheel up for a faster intake and a lower twist. That’s not to say you want the intake so fast that it rips the fiber out of your hands. You know what you are comfortable with and how your wheel works. If you are using double drive, use a smaller ended bobbin and a larger ended whorl and a higher tension on the drive band. With an Irish or Scotch Tension, you want to tighten the brake a smidge more than average. And don’t treadle quickly. It’s not a race. Take it slow. Your fiber – I think you can use any well prepped fiber but a combed top might be a little easier at least in the beginning. You want your fiber pre drafted well and have a bunch of it ready. I also find using a handpaint helps for your first time. The variation in color will help you see the twist better than using a colid color. Using a long draw method will help to keep your singles even. The rules change slightly depending on the thickness of your yarn. Of course the rule of “the thinner the yarn, the more twist you need”, still applies to low twist singles. Therefore you will need a little more twist in your thin yarn than you would if you were using a bulky low twist single. This takes a bit of practice. Each wheel has it’s own settings that it prefers to be at for this maneuver. My best suggestion is that you grab a scrap piece of fiber that is similar to what you want to work with, predraft it properly, and then monkey with the setting until you get it to the right setting. Just be mindful of what you are doing and you can do it. I think it takes a bit more concentration for most when they’re first trying this and then it gets easier each time you sit down to do this. To see if you are getting the right angle of twist I’m going to point you to an article that PippiKneeSocks wrote for Knitty. HERE is the article. It’s for a different type of yarn but I think she accurately describes the angle and gives you a good idea how to check the twist angle yourself. Now your yarn is made – how do you finish it? I like to full my singles yarn. It gives it a little more strength and a finish that doesn’t seem to want to immediately pill. Especially if you are using Merino. That’s not to say this method will guarantee it not to pill, singles yarn is more prone to pilling. All I’m saying is that it will be a little hardier and less likely to pill quickly. I prefer not to full yarn in the washer – it’s too fast and it can easily get out of control in a short amount of time. Fill two sinks with water – one with hot soapy water and one with ice cold water. Make sure your yarn is tied in at least 4 spots. Not tight, but tied so it’s not going to some undone. Wearing good kitchen gloves, I dunk the yarn in the hot soapy water and rough it up. Smoosh it around and rub it between my hands. I squeeze out the water and dunk it in the cold water. I pick out and squeeze out the water and do it all over again. I do this several times until the strands are just starting to stick together. I don’t want them to be felted together entirely but just a beginning gives me the idea that they’re fulling right and it’s time to stop. I do the thwack, whack, or snap and hang it to dry. That’s all there is to it. I know the directions seemed a bit long but it really condenses once you are doing it. Soon I’ll show you what I’m doing with my multicolored skeins. I dyed up extra in case one is interested in this particular set, just email me. There are a little over 12 ounces. I’ve been thinking shawl….but then I’ve been thinking if I card up some plain CVM in its original grey I could do a fair isle band and make a lovely cardigan….. It will all have to wait to see how the yarn comes out. 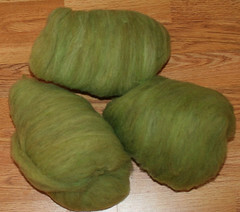 I’m spinning for a sport-DK weight 2 ply. *sigh.. so much good info. Makes me miss you more. Also, I want to let you know how much I enjoy your receipes. I am vegan (except for that wool thing blush, blush)and get some good ideas from you. I’m so glad we got those yummy yarn/fiber pictures today! Absolutely beautiful spinning and colors! Great info on energized singles – I really had never thought about using them and will tuck it in the back of my mind for the future. Thanks for the tutorial! I’ve been thinking of foraying into spinning singles for single sake lately. Amy, thank you so much for posting about this – you always have great info (and yummy food!). It is very timely for me, as I have been getting interested in seeing just what I can do with singles as opposed to always planning for plies. I’ll just add to the thanks for posting this! I think it’s time to “grow up” in my spinning a little more and follow some instructions (as you have probably guessed, I’m a jump in and give it a try kind of girl). 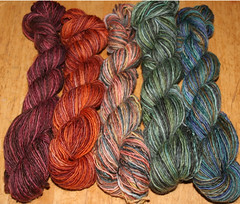 lovely skeins! and a nice writeup on the process, thanks! Did their appearance change much from pre- to post-fulling? And do you ever full your other yarns, or do you just do this to singles? I just started spinning at Christmas time. This information was very informative and easy to understand. Thank you! Thanks for the how to! I don’t know how often I will want to knit with my singles but I am glad to know how to full them for durability. I might have to just try it out and see how it goes. This was the most perfectly timed post! I’m a beginning spinner and am embarking on a project to spin up singles (for lace) from Wensleydale. I’ve been thinking about/working on how to achieve the appropriate amount of twist — your information was incredibly helpful. Thank you! I am totally over the moon for the green singles… the way that the colors blend from light to dark. It’s so spring-ish. I need to set up an appointment with you for some spinning help- not on the spinning itself so much as the whole ratio thing. I am way lost on that stuff… which might explain why I have yet to create a laceweight yarn. I have to say, you are a font of information. Thanks for all the good stuff. I am sure to star this blog post in my reader to refer to again and again! I am also going to post a link to this in the Beginning Spinners group. Thanks Amy! I’ve always been interested in spinning singles but have always worried about how much they would pill, especially if they were merino. I’m going to have to try this trick and see what happens. Many thanks for posting this tute! I found this post and the one on spinning lace really interesting. I often feel like I am totally winging it and that if I only had some spinners around to show me a few things my knowledge would grow exponentially. Thanks so much for these posts – they’re definitely going on my techniques and resources page!